This project was for a major manufacturer of a tableted OTC analgesic. The manufacturing process was being redesigned, and a critical aspect of the work was the re-engineering of a reactor. 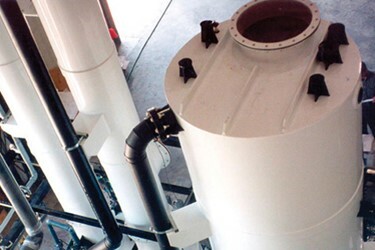 The client’s original process, which used nitric acid to dissolve a metal, exhausted virtually 100% nitrogen oxide (NO), a gas that reacts with oxygen to form a brown plume at concentrations as low as 50-125 ppm, depending on stack diameter.